About twenty five thousand years ago, men painted the walls of the caves at Lascaux and Altmira, telling us that long before agriculture began people were marking places as of special significance to their society, places where humanity, nature, and the Earth could be felt as united. Caves were painted in this ways up to the nineteenth century in some parts of the world, but once agriculture created stable communities tied to one place, they began to identify some places as sacred, temples, in their landscape. It appears that in most societies the earliest reverence for the force of creation understood that power to be feminine, the Great Mother of all, the Goddess. The earliest of European carvings are statuettes of pregnant women, the divine as mother, and it is uncanny, a source of wonder, that the same appears to be the case in Mexico. The culture of Mexico seems to be unique in achieving about the thousand years of development ignorant of any other culture at all. They regarded the people immediately north and south of them in much the same way as the early Greeks regarded to people north of them - barbarians. The fact that the pregnant votive figurines of Mexico are much later than the European figures cannot be attributed to influence from abroad makes this an inherent human trait independent of culture. A people waking to reflective consciousness for the first time sees the earth as Mother, and regards this mother as super-human, divine. The result in Europe is that the most enduring of the earliest structures are tomb temples that seem to represent the womb of the world, in some cases oriented so that dawn sunlight would penetrate to the centre of the interior on special days, usually midwinter. 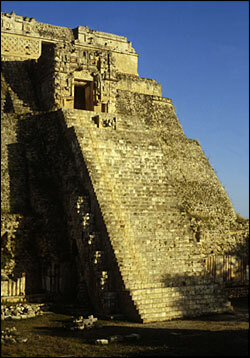 It may be that the temples of Egypt, and even those of Mexico, are descended from such a temple concept. 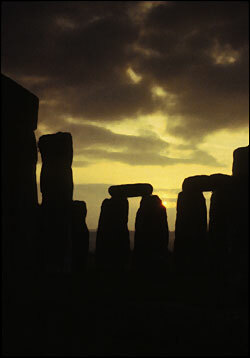 Enigmatic and evocative, stone circles and stone rows were built widely in Europe by the Bronze Age people, and, as in the Neolithic period, the ceremonial/religious structures seem to have been built by people who had no great need for defensive structures, by people probably mainly at peace. Perhaps it was the defence of this civilisation against more the efficiently armed people of the early Iron Age that produced in Britain the beginning of the Arthurian legends. Do the stone circles and avenues echo clearings and lanes in the forests from which these farmers had come, forests that were being cleared to make space for their crops? There is little doubt that the alignments are related to the movement of the Sun and stars, as if the focus of attention had moved from the Earth to the sky, a larger grasp of nature. We, in our generation, with men, and telescopes, and cameras, sent into space, have seen more wonders of the Universe than anyone before, all of which may be said to have started in the Bronze Age, three or four millennia ago. Two and a half thousand years ago great strides of understanding were being made in Asia and Europe, in India and in Greece. Classical Greece is the true start of European civilisation, and the thinkers of that age, Socrates, Plato, and Aristotle are as basic to our thought today as they were in the past. 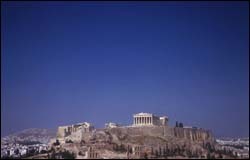 The golden age of Athens was based on military strength, but its heritage to us is in its mythology, thought, and architecture. 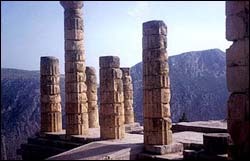 The Greek temple, an enclosed space folded into a rectangle of stone columns, seems to bring together the tomb temple and the stone circle, the cave and the forest, and the ceremonial embraced both. The buildings themselves were designed with a subtle perfection that is unique. The Parthenon on its Acropolis is a model of immobile, static, balance, which we need only see with attentive clarity to be brought to absolute mental peace. It is intact enough still to communicate its original quality, but other temples, in their ruined condition, become rather a part of the landscape, flashes of conciousness in the natural world. Centuries later, after the Roman successors to Greek civilisation, and after the close of the Dark Ages, when civilisation returned to Europe, it was a Christian civilisation, and its temples, the cathedrals, reversed the Greek model, so that instead of a sanctuary surrounded by a forest (of stone pillars), we have a sanctuary enclosing a forest (of stone pillars), and entry into the temple is a route through the dark forest into the light. In a clearer way than ever considered previously, the quality of the architecture was internal, and was deliberately intended to be psychologically transformative. The character of the architecture is the very reverse of the calm balance of the Greek temple - a forest of vertical shafts takes the eye to bright and coloured light far overhead, a journey to equilibrium through ecstacy rather than through peace. The temple journey started with entry into the dark cave in the source of all, the Earth, and culminates in the dark cathedral offering a ladder to sublime experience of the light. Light is the highest metaphor for understanding. The journey begins in a physical temple, but the real journey is through an inner temple, in the imagination, in the psyche, where the light of understanding can produce an almost magical transformation, where we see in a new way, everything connected, and whole, a different consciousness.